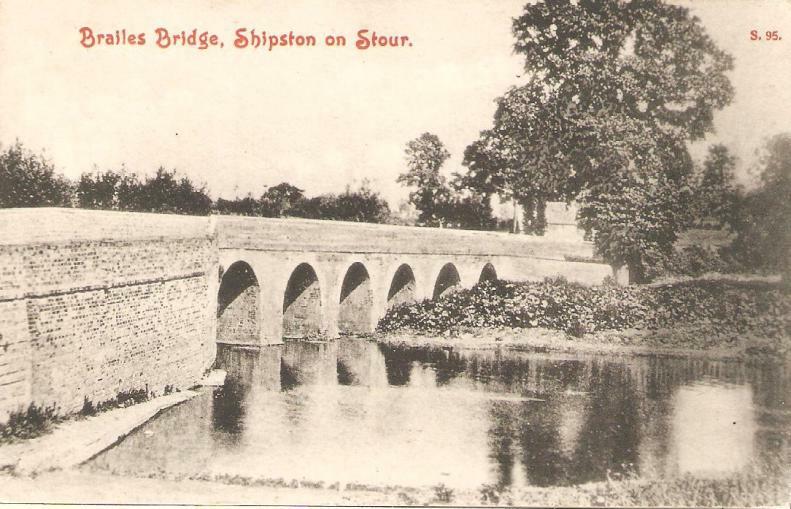 Brailes Bridge, Shipston-on-Stour, Warwickshire - Postcard posted in 1912. 'Extract of a Letter from Brailes, in Warwickshire, dated June 11 1765. '... the village of BRAILES, which had formerly a market, obtained for it by a charter from King Henry the third, together with an annual fair for three days; the market has long been discontinued, but a fair is annually held there on Easter Tuesday.' (p.285, Warwickshire Delineated by Francis Smith (of Southam), 1820). 'By this time the traveller who has followed me from Edgehill will be glad to find a comfortable inn, and such a one he will find in the George at Brailes, a familiar resort of the county squires of former days, and even now much frequented by hunting men. As we thread the shady lanes that lead us thither from Compton Wynyates, which here and there give us a view of the well-wooded country on either side, it is hard to realise that this part of Warwickshire is called the Feldon, that is, the land from which timber has been cleared away, to distinguish it from the woodland district of the Forest of Arden, which lies to the north of the Avon. Brailes Church, from its size and massive tower, is known as the "Cathedral of the Feldon," and it well deserves the name. As we turn a corner of the lane the tower comes into sight, the central object in a vast amphitheatre of meadow, wood and hill. The church stands in the highest part of the village, not far from the inn. Nothing can be finer than the exterior ; the lofty tower, 120 feet high, and wide in proportion, the long clerestory rising above the aisles, the open foliated parapet on the south side, with a cornice elaborately carved with grotesques beneath, and the rich orange tints of the stone, command our wonder and admiration. Enter the church, and alas ! the scene is changed. The expectations raised by such an outside are doomed to disappointment ; the plaster has been ruthlessly scraped from the walls, almost every trace of the sanctifying hand of time has been removed, and the whole has a strange, cold look, from the contrast with the exterior all the more repellent. 'There is not much else, always excepting the comfortable inn, to detain us at Brailes. Brailes House, in which the last survivor of the Sheldon family recently died, is now a forlorn and deserted mansion. Up to the beginning of the nineteenth century the Sheldons were only second to the Comptons in local importance. They had a fine house at Weston Park, four miles to the south-west, and the landlord at the inn will show you the names of some of them cut with a diamond on the window panes, and also an old rent book of the family, which shows that their estates were spread over half-a-dozen parishes. The most famous of them was Ralph Sheldon, the squire of the seventeenth century. He was an indefatigable collector of books, manuscripts, and antiquities. Readers of Anthony Wood's autobiography will remember how often he would walk over to Weston from Oxford to visit his friend and patron, and how many happy weeks he spent there arranging and cataloguing the library. Weston enjoyed the distinction of possessing this fine library for a century after the death of its collector, but when poverty comes in at the door, books fly out of the window, and in 1781, when the squire of that day slept with his fathers, it was brought to the hammer at Long Compton. Ralph's copy of the first folio Shakespeare, and a large collection of old plays, were among its chief treasures. The former now belongs to Lady Burdett-Coutts, and many of the latter are in the Malone collection in the Bodleian. (...) 'It is time to resume our pilgrimage along the " Via Sacra," and I must leave Brailes by the Banbury road in the opposite direction, and climb the hill till I come to the spot where the gallows once stood, and where a remnant of the original heath is still left. The Brailes people call it Gallows Hill to this day. The rough track to the right is the ancient road I am in search of: for several miles it forms the boundary between the counties of Oxford and Warwick, and before the days of shires may well have marked a still more ancient division of the land. I follow its course down to Traitor's Ford, and surely if ever there was a name suggestive of antique story this is one. But I have been quite unable to hear of any story connecting any traitor with the spot, nor does anyone appear to be able to give any explanation of the name. Can it have any remote connexion with the treachery of the Whispering Knights to which we shall come directly? The only legend connected with the place I could pick up was told me by the landlord of the Unicorn at Great Rollright. The great bell, he said, which now hangs in Brailes Tower, was dug up here. Perhaps this story arose from the fact that when the bell was being taken away to be recast, I know not how many years ago, the conveyance broke down on Gallows Hill, and the bell lay by the roadside for a long time before it was removed.